IKO enertherm ALU Insulation is designed to be used in combination with mechanically fastened and self-adhesive waterproofing membranes. It is also used as part of certain other cold applied / torch applied hybrid waterproofing systems. The boards are suitable for use, over a suitable vapour control layer, onto supporting substrates such as profiled metal decking, timber panels, screeded concrete, or to upgrade existing sound bitumen roofing systems. 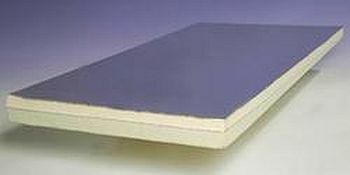 IKO enertherm ALU Insulation boards offer outstanding insulating properties, with a thermal conductivity of 0.023 W/mK. Other thicknesses and tapered schemes are available to order, contact IKO Technical Services. Insert details. Other thicknesses are available upon request.